BRISTOL - Frank Loukoumis says he’s worked hard to become what he is now: owner of Frank’s Restaurant for over 20 years. “I had to go up the ladder before I could be where I am today,” said Loukoumis. When Loukoumis was growing up in the New York borough of Queens, he worked as a dishwasher at diners. When he was a freshman in high school, his family moved to Bristol. Loukoumis continued to work hard and, after saving enough money, was able to buy his own restaurant. “Frank’s has been around since 1972,” said Loukoumis. Loukoumis said his favorite part of his days at the diner is seeing the Bristol community. “We have a lot of regulars that come in for breakfast and lunch. Since Frank’s has been around for so long, we have grandparents bringing their grandchildren, or parents bringing in their children and telling their children how their parents used to bring them. This diner is full of different generations. My customers are very important to me,” said Loukoumis. Frank’s Restaurant serves classic diner breakfast foods, from buttermilk pancakes to eggs served any style. “I’d have to say our buttermilk pancakes are the most popular item on the menu. That, and our Belgian waffles, especially our Tropical Waffle, which has bananas, strawberries and whipped cream,” said Loukoumis. Frank’s Restaurant also serves a variety of daily lunch specials. “With our horseshoe counter, friendly staff and classic food, we like to keep our traditional old-school charm. We’re going to continue to run Frank’s and just keep providing the same service,” said Loukoumis. 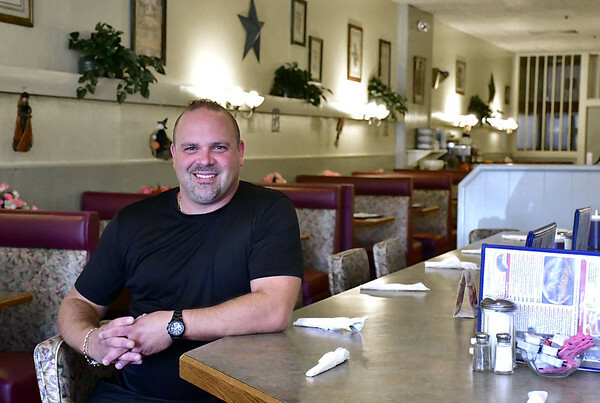 Loukoumis also owns the Main Street Diner in Plainville. Frank’s Restaurant, at 99 Farmington Ave., is open every day from 7 a.m. to 2 p.m.
For more information, visit www.franksrestaurant.net or call 860-584-0002. Posted in The Bristol Press, Bristol, Dining on Tuesday, 25 September 2018 21:15. Updated: Tuesday, 25 September 2018 21:18.